Denis MacShane is a former UK Minister for Europe and the author of Brexit: How Britain Will Leave Europe (IB Tauris). 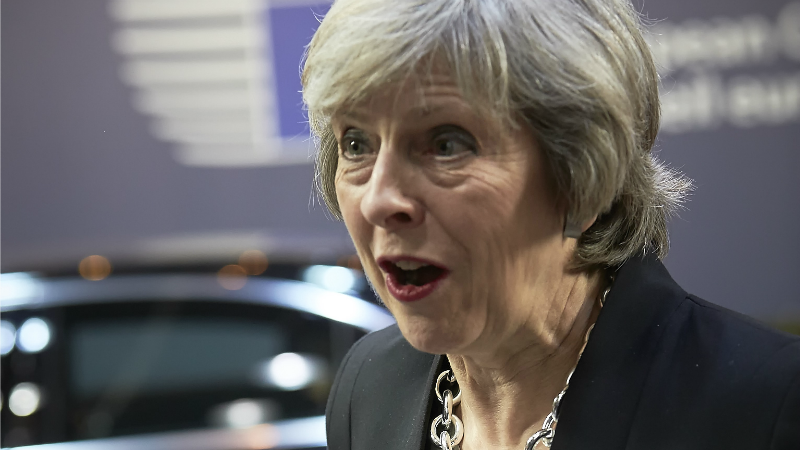 More importantly, the long list of things May doesn’t like about Europe – none of which were on the ballot paper on 23 June 2016 – are identical to some of the campaign points of Marine Le Pen in France, Geert Wilders in the Netherlands, or Frauke Petry in Germany who are running on eurosceptic tickets in national elections this year. Mark Rutte, the centre-right PM in the Netherlands, François Fillon, the conservative challenger for the Elysée and, above all, Angela Merkel in Germany will not be thanking May for echoing all the criticisms of Europe from their opponents. The eurozone has just posted a massive balance of trade surplus so her view that Britain is the model to follow won’t make much sense in Berlin or the Netherlands. As Iain Martin writes in his book on the Big Bang, the reason it worked was that the City took advantage of the single market to steal as much global financial business as it could by pitching to every foreign bank and finance house that if they opened in London they would be able to buy and sell in every corner of Europe. The idea that Frankfurt, or Vienna, Paris or Dublin must not take advantage of Britain turning its back on the single market defies all history of trade. As the Deutsche Boerse report published yesterday (16 December) shows, Frankfurt will now move to get the lucrative London trade in euros moved to the EU. The ECB and the European Commission, as well as national finance ministers, have endorsed this policy and the idea they will forgo making a profit to help May is not realistic. 1,000 Japanese firms have set up shop in the UK having been promised by Margaret Thatcher and all her successors – up to now – they would have access to the market of 500 million customers without let or hindrance. That promise is now dead. Other countries like Switzerland or Norway have done deals with the EU on the single market without joining the EU. It seems odd that this option was not explored. The oddest part of the speech was about the EU Customs Union. A Customs Union can include some exceptions. Turkey is in the EU Customs Union but not for agricultural products – but a country cannot claim to have its own private trade deals but still stay in a Customs Union where tariffs and duties are uniform. So stand by for filling in millions of customs forms and big queues at Dover and Folkestone as lorries, van and car boots have to inspected. All these are matters for negotiations. Not the Article 50 negotiations which will get going only after the EU has chosen its government leaders in France in May and Germany in September. The Article 50 talks have to be over in October 2018 to allow 27 national governments and parliaments time to ratify a withdrawal agreement for Britain to leave the EU before the next European Parliament is elected and Commission chosen in May 2019. So there is at best 12 months of serious talks. Chatter about a UK-US trade deal are not serious as nothing can happen legally until the UK is out of the EU and in any case it is the US Congress, not the White House that decides trade deals. Will either London or Washington want to have contentious trade deals featuring in elections in the US and the UK in 2020? In short, Theresa May has announced several years of tough talks with Europe stretching well into the 2020s. In that time opinions may change. Right now there is still a ‘sugar-rush’ glow in the UK economy as interest rate cuts, more QE printing of money, and stepped up government spending plus consumers on a buying spree before the devalued pound impacts on prices have kept up consumption. Will that feel good economy still be there in 2018 or early 2019 especially if foreign investors quietly reduce their presence in the UK? On the whole, a Conservative premier and Conservative MPs do not enjoy presiding over a reduction in the nation’s income and wealth. Today, it was ‘politics stupid’ as May decided that only the views of 37% of the electorate who voted for Brexit should be taken into consideration. If in two years’ time it is ‘economics stupid’ as the UK economy looks shaky then the politics will change. If conversely, Theresa May’s amputation of the UK from the world’s biggest market turns out to herald the dawn of a new glorious era for British firms and people, then the Brexit vote and the way she has chosen to interpret it will be well and truly validated. Well, when it comes to signing new free trade agreements, good luck, Great Britain. The day of the British Empire is over. You are going to find that these countries you want to sign agreements with are very competitive and you will be importing from them, not exporting. The Americans smell blood. Do you think Trump does not see the weakness? I feel that many times people from large, powerful nations overestimate how independant they can be in the world. People talk in Britain about a new Anglo trade relationship with Australia, New Zealand, Canada, and the U.S., however these countries are merely interested in broadening their trade relations, not moving to a new Anglo one. Mexico will always be more important to Canada and the U.S. than Britain. It is 2017. Not 1917. The 3 biggest overseas travel destinations of Canadians are Mexico, Cuba, and the Dominican Republic. The world has changed for us. I do wish your pro EU fanatics would join the 21st Century. The days of empire are long gone, something Brussels totally fails to understand. As for the rest of your diatribe, it will be ignored as pure Brussels propaganda. @Ivan, if the days of empire are long gone, then please do stop pestering us with pseudo-heroic gibberish about a global Britain, re-engaging with the commonwealth and all that. Do answer me this: who do you think will leave the pointless UK next, the Scottish or the Northern Irish?